"Terrible!" said the Tabby. "I was checking out the supply closet, you know, since it was open, and a human locked me in! I scratched at that door all day long!" The Siamese rolled her eyes. Only then did he notice her shaved belly -- and stitches! "You think you've had a bad day..." she said. Space, or Jar Jar Binks. There's a new (belated) Hero of the Month! We had a pretty good week. Over the weekend we did some social stuff... on Saturday night, we attended Fuschia Shock (see the GinohnNews for a report on that, and on the movie we saw with them), while on Sunday we got together with most of my family for some birthday celebrations. Here we see my brother Jeff's twins as they open the unbirthday gifts we gave them. 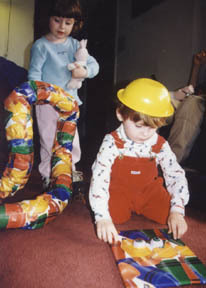 Note the bowl James is wearing as a hat - it was amazing how persistently that thing stayed on his head! He's 3 now, and insists on being referred to as "LoveyCup Cowboy". Sharon (my goddaughter) is opening a really cool snake we found at Ikea, and it was a big hit: the two of them were very entertaining as they ran circles around the house, pulling that snake between them. But then the weekend was over, and we had to get back to work on the problem that has gradually been crushing our skulls: MONEY. Naturally, there's that income tax thing, which those of us who procrastinate are all currently dealing with; but we've also been confronting our general need for additional funding. Things are going very well for Looney Labs, well enough in fact that in order to grow, we need more money. So, we've decided it's finally time to start considering the idea of Venture Capital. During all our years as Icehouse Games and most of our time as Looney Labs, we've been totally unwilling to even consider the idea of getting involved with a venture capitalist. There were many reasons for this... partly it was standard issue Game Inventor's Delusional-Paranoia: the fear that we'd be giving up control of our company to someone who might turn Evil (footnote: we founded our first company shortly after seeing the movie Tucker: The Man and His Dream), combined with naive preconceptions about the value of Our Brilliant Ideas as compared to the value of Funding; but mostly, I think it was a simple lack of confidence. While we certainly believed that our ideas had the potential for huge success, we were realistic enough to understand that our ideas were just that, ideas, and that until we had a proven product it would be premature to ask someone else to invest a lot of money in marketing it. So for many years, game publishing was just a hobby for us, something we did just in our spare time. But over the past ten years, our games have matured, our marketbase has grown, our skills and abilities have expanded, and our belief that this is a viable business venture has solidified. Last year, Kristin and I took what we called the leap off the cliff, and quit our high tech day jobs to pursue our dream of running a game company full-time. Since then, we've been using our savings, and the sterling credit our DINK lifestyle had given us, to fund our operations, with the hope that we could get profitable before the money ran out. And unfortunately, while we've had an absolutely incredible year, the money is nevertheless running out. The problem isn't a lack of success... if anything, it's the reverse. Things are going really well: our games are selling briskly, we have an ever-increasing fanbase, stores everywhere are calling us, asking how to carry our stuff... and we've got more ideas for new games than we've even got time to play, let alone publish. And that's the problem: we don't have the funding we need to expand, and we couldn't get all the work done ourselves even if we did. We need help, both financially and in terms of manpower. So, we need money in order grow. This is not news; back in January, our business-student friend from Texas, Leslie Burgoyne, spent her winter break with us, helping us writing our business plan, and this week, we finally filled out all the paperwork necessary to officially request a business loan from our bank. But as we look at the expenses we face in the near future, we are forced to realize that we're not going to get as much money as we need from our bank. Banks look for collateral, and while we've got lots of valuable game inventory and lots of semi-valuable TSI stock, it's doubtful that our bank will offer us as much as we need. So, we're finally considering Venture Capital. And as we've been thinking about it, two quotes have been sticking in my mind. The first came from Mike Webb, of Zocchi Distributing, with whom I spoke at Toy Fair. He was telling me that another company had struck some sort of funding deal with his, and that this was really great because it was going to allow them to properly fulfill their vision of how to do business; the second is from Dale, who asked us at ToasterCon if we'd thought about how we might benefit, not just from the Venture Capitalists' money, but from their accumulated knowledge and experience. And I had to say, I'd never really thought about it that way before... we've always just been fearful of letting outsiders come in and take over. So, this week we changed our minds: For the first time ever, we are interested in Venture Capital. Trouble is, we don't know much about it. So the question of the week is this: How do we go about finding a venture capitalist we can work with, someone who like games, understands the internet, and agrees with our manifold corporate philosophies? This is the task at hand for the coming weeks and months, as we begin our search for funding in earnest. Alliance Game Distributors, by far the largest in the business, has decided to pick up our entire line! Just after I graduated from it, my elementary school was torn down, replaced by a new one built in the old school's ballfield. This week I heard the same thing's happening to my high school building this summer. I suppose it's every student's dream, to see their school destroyed... but I'm a sentimental fool.